EVs Do you need the stress? You are at:Home»Features»EVs Do you need the stress? It doesn’t always rain when charging in Ireland! Talk about stress! Electric vehicles are brilliant – when they have ample electricity – but when they don’t it’s another story! EV’s electric torquey motors are great and can quietly haul a tonne-plus of metal around with ease. There is the added bonus of blistering acceleration as most EVs can out-accelerate your average hot hatchback. However there is a but and its a big BUT, when they go low on power the most horrible of feelings sinks in for the driver. Where the hell is the nearest charging point and will it be free? I’ve tested lots of EVs and suffered range anxiety in most. It really is a nasty feeling. 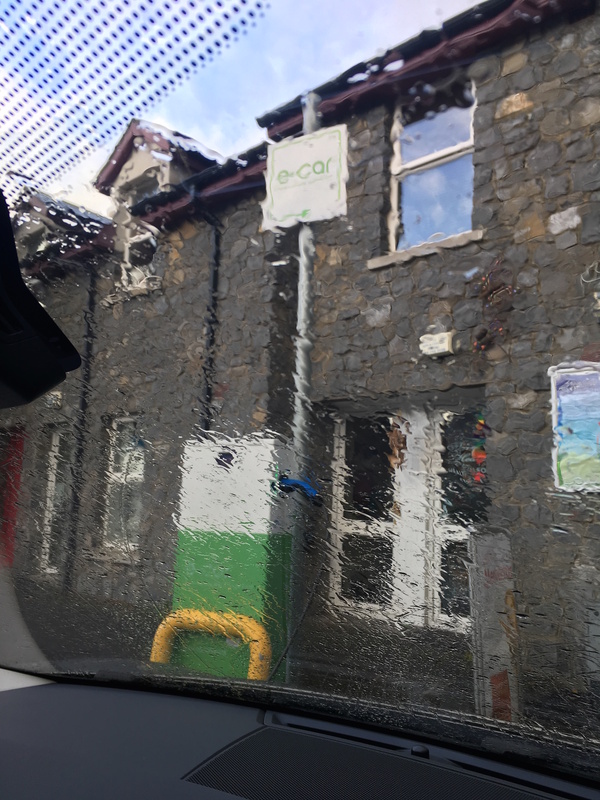 I was running low on electricity recently and made a dash to a public fast charge point that my smart phone’s ‘eCars’ app (Ireland’s EV public charging network) was saying was unoccupied. The beautiful and utterly brilliant Jaguar I-Pace that I was testing at the time had just 62 kilometres range indicated in the tank, I still had 40kms to go on my journey. I had already done a chunk of rural driving in the car and was happy that the big cat would do the distance indicated to my home charger but a fast charge is always a preference. But here’s the kicker, as I pulled in to the filling station and located the electric charger bays my heart sank. Not one but two Nissan Leafs were in the bays ahead of me – one was plugged in and juicing up and the other waiting to go next. I mumbled a few choice words to myself – mostly about the other EV drivers parentage and then took a deep breath and resigned myself to yet another charging point disappointment. Infrastructure in Ireland should be brilliant as there is one main electricity supplier and free public charging – but sadly you cannot rely on it. Even if the charge point is free the charger might not be functioning or it might be occupied for an indefinite period and you could be stranded for hours. It is a first world problem and indeed could be worse. Many European countries have numerous electricity suppliers and charging point suppliers. This requires a huge wallet for all the charge cards needed to activate and pay for the electricity. The simple reality is, no matter where you are, it is a risk relying on the public charging network and this makes having a home charger a must. With EVs unlike fossil fuel cars, when you run out of fuel you cannot simply walk to the nearest filling station and fill up a jerry can with electricity to top up your empty tank. Yes there are emergency generators that can deliver a quick jolt to get you to the next charger but in no way is fuelling an EV as easy as filling up a petrol or diesel car. 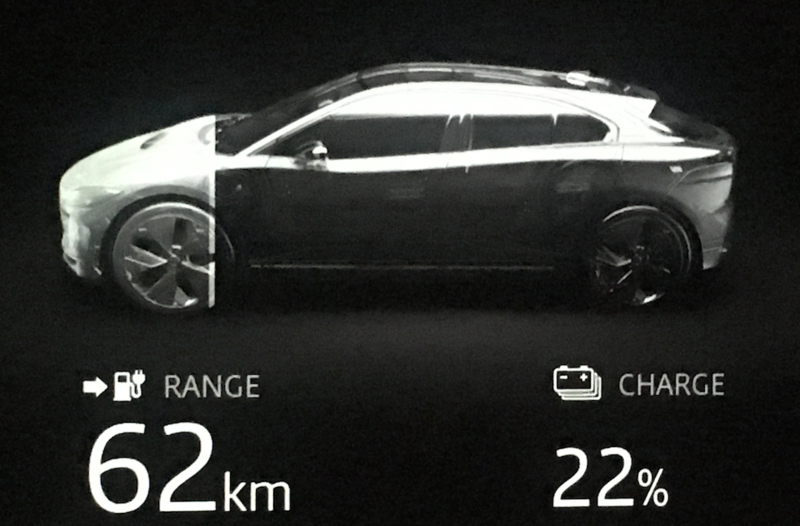 Statistically most journeys are short and well within the range of any EV. Drivers in Ireland tend to average less than 80 kilometres in total per day so no problem. 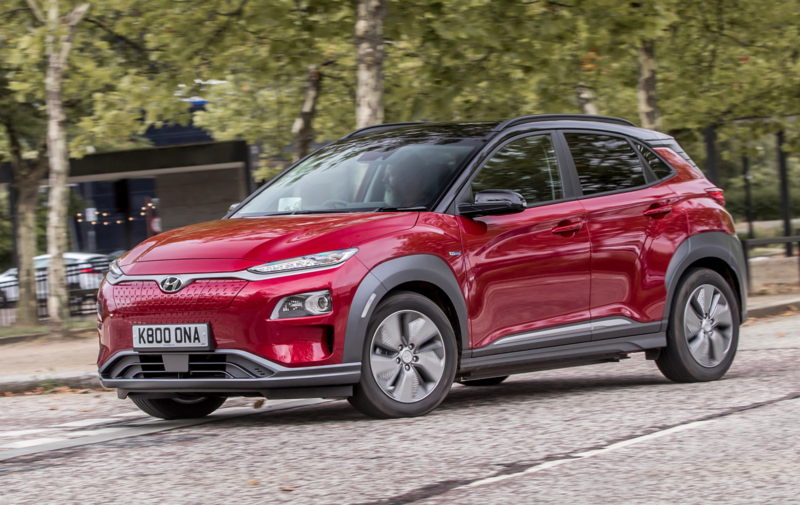 With far fewer moving parts than an internal combustion engined car – not to mention the ease of use automatic transmission brings and the efficiency of regenerative braking, EVs should be everywhere. Many EV buyers are motivated by the noble idea of doing their bit to cut emissions – saving the planet and its true that by driving a zero emissions (at the tailpipe) you are not damaging the air quality where you drive it. So owning an EV is a great thing and should be applauded but ensuring it fits in to your life and demands is another matter entirely. If you don’t go into the deal with your eyes wide open you will be burned. There are a number of great EVs out there already despite the tiny take up by the buying public. Volkswagen is set to launch a raft of new EVs in an attempt to make amends for its dieselgate emissions scandal while every car maker is following suit. 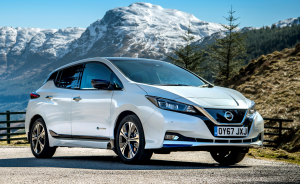 Nissan’s new 40kWh Leaf recently won Irish Green Car of the Year 2019 and I’m glad I voted for it. Ireland’s best selling EV, in its latest more main stream looking guise, has much improved range. This means it is usable day to day and even on a commute with only minor planing needed for longer trips. I stand over saying it has a 260kms realistic range. By realistic I mean the figure is doable with the air conditioning on and generally driving it as you would any other petrol or diesel machine. 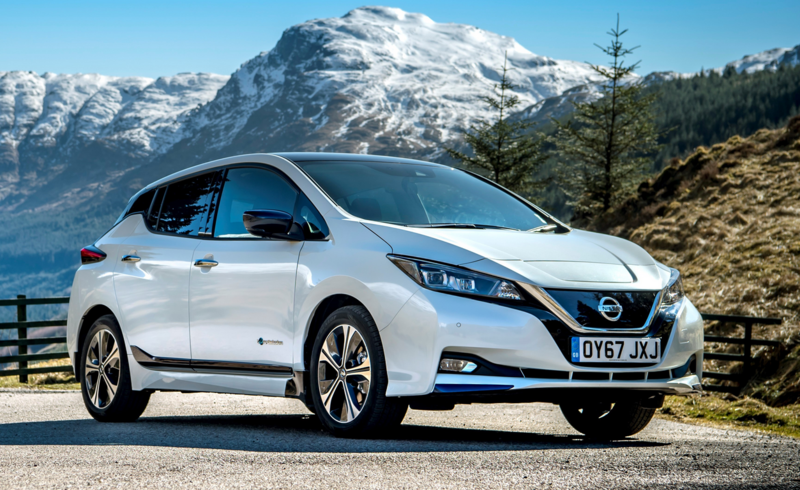 Nissan quotes a higher range, don’t they all, but EVs in order to be successful need to perform well in the real world and not in a world of full of EV hobbyists and early adopter tech nerds (no offence, I’m one too!). The Nissan lets users do a mix of motorway, rural and city driving without having to fret over where to charge up. In my case I can simply do it at home in the evening and this model of use is the ideal one. The best use of the nation’s precious electricity is to have car owners charging overnight as industry sleeps. This way the grid is not creaking under the strain to deliver power during the day. Extensive use of green wind energy is the plan but at present and somewhat ironically it is the fossil fuel ‘Peat’ that is used to power most Irish electricity generation stations. Let’s also remember we also buy-in electricity from the UK and it’s mostly generated by evil nuclear power! So while we may all feel all smug and green behind the wheel of an EV we must note the power still comes at a cost to the environment. Ireland’s electricity is still far from green. Norway – Europe’s poster boy for EV use, has the ideal power source of hydro generated electricity. 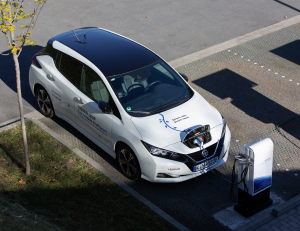 The Leaf will get even more range with a bigger 60kWh battery option in 2019. 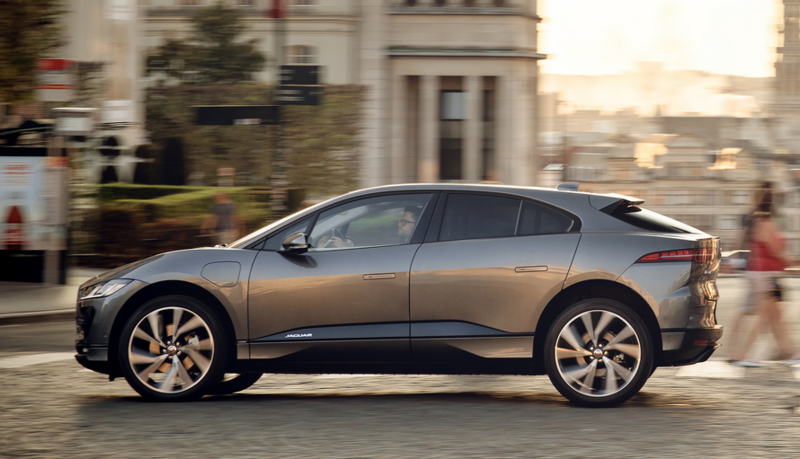 The Jaguar I-Pace is treble the cost of the Japanese machine and a much more luxurious machine. The Jag is a handsome crossover that surprises people when you say it is an EV as it is so on trend in terms of styling. The I-Pace has a big 90kWh battery pack so it can do a commute while delivering Tesla challenging performance. Another instantly acceptable machine is the Volkswagen eGolf, it has been with us a while and lacks range but in its favour is the fact it is a thoroughly conventional looking car. 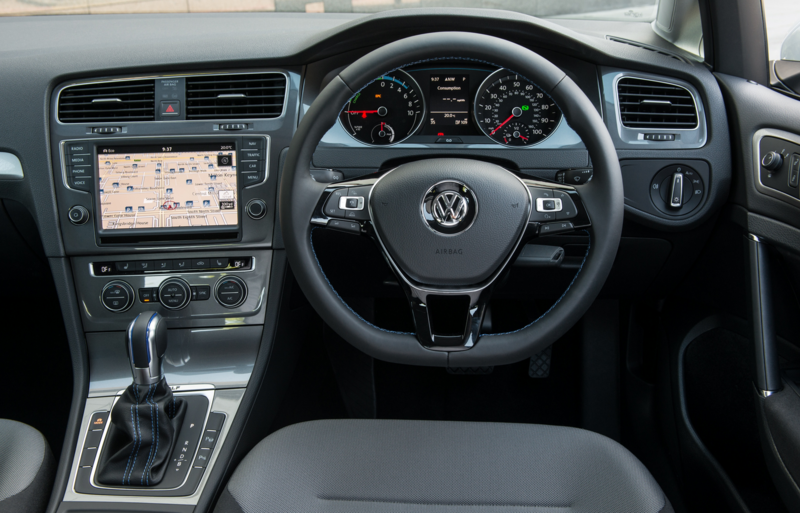 The eGolf looks only slightly different to a Golf thanks to being built and riding on the same modular platform (MQB) that the traditional engined Golf uses. Even with planning an EV is not for the faint hearted. I did a run in an eGolf recently with my son to a rugby match held literally in the middle of Ireland from Wicklow on the east coast. The round trip was a little over 340 kilometres. 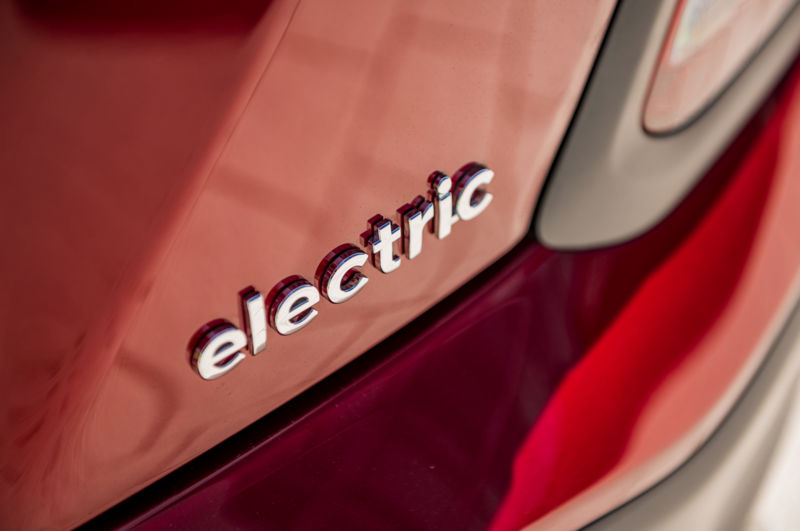 Volkswagen’s eGolf has three driving modes with Eco+ the most frugal on electricity. The outbound leg would see speed capped to a maximum of 95kph (higher would generate too much aerodynamic drag) and in this mode the climate control is firmly off. My most economical hyper-mileing driving techniques would be employed to the full. There’s an old EV joke that goes how can you spot an EV driver? They’re the ones with their coats on! Looking like Scott of the Antarctic I was determined to battled the car’s misting up windows to get my talented centre to his match. After a full overnight charge the car said 299kms was available/possible. Over the first 30 kilometres or so the range indicator dropped alarmingly. Eventually some 170 kilometres later we arrived with less than 40 kilometres of remaining range displayed (or 210 total range). 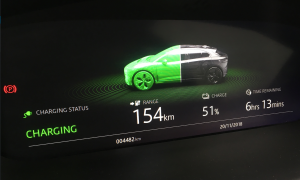 We were in a sparsely populated village in the heart of the country, some 25 kilometres from the nearest public charge point and a bit further from the nearest fast charger. Thankfully the rugby match was won but fearing for the charging delays on the return leg I put my son on the team bus home. Quiet logically I was thinking the weight saving may come in to play – is this something drivers should have to think of! I knew the regular charge point would require a really long stay to give me the range I needed to get home so I dared to travel to the fast charger. The eCars app on my phone said the charge point was unoccupied so with fingers crossed I made a run for it. Thankfully the charger was free when I arrived and I plugged in – almost giddy with relief. It turned out I needed a full 45 minutes to get enough range in the batteries to make it back to Wicklow. Apart from a Tesla Model S trying to nick some of my charge points power (you get very territorial) I had no other company in the two car bay. Some unhealthy snacks later and I was on the road again, confident I could make it home. With an EV you have to learn your car and relearn how you drive. The shortest route may not always be the best as you factor in the route’s topography and factor in motorways and their impact on battery consumption. High mileage users should not consider EVs and even Tesla owners, who’s cars have huge battery packs, find massive mileage a struggle as they still have to feed their beasts. In 2019 a raft of higher capacity EVs for the masses will start to arrive. 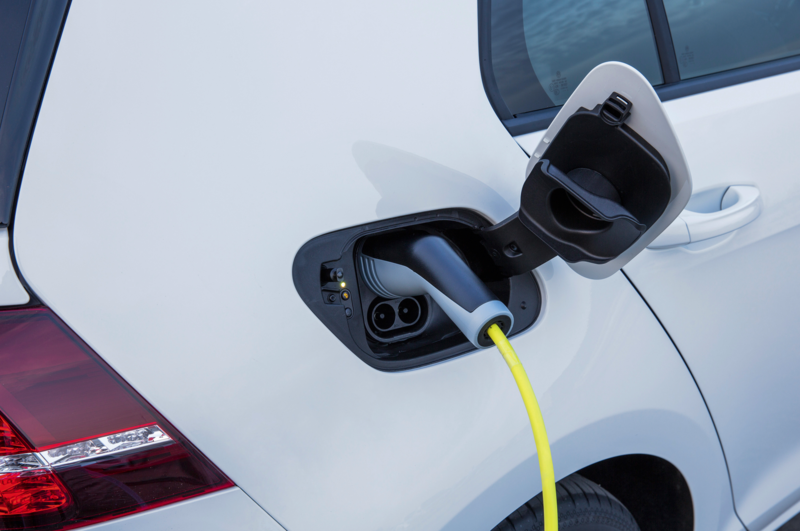 The Irish government offers excellent purchase grants plus capital and benefit in kind tax incentives to help people step in to EVs – especially if they are sub €50,000 new. EV buyers need to be aware that the public charging network should only be looked at as a reserve or back up and not the primary source of charging. If you buy an EV without a home charger you are in for a rude awakening and will have no one to blame but yourself for the stress.